There are a few proven ways, other than winning, to earn the respect of the rusted-on regulars who fill the coliseum-like parade ring at Sha Tin racecourse. Returning to race on the same day after a fall and riding like an absolute demon, even when well beaten, in every single race, are sure fire ways to become a fan favourite. 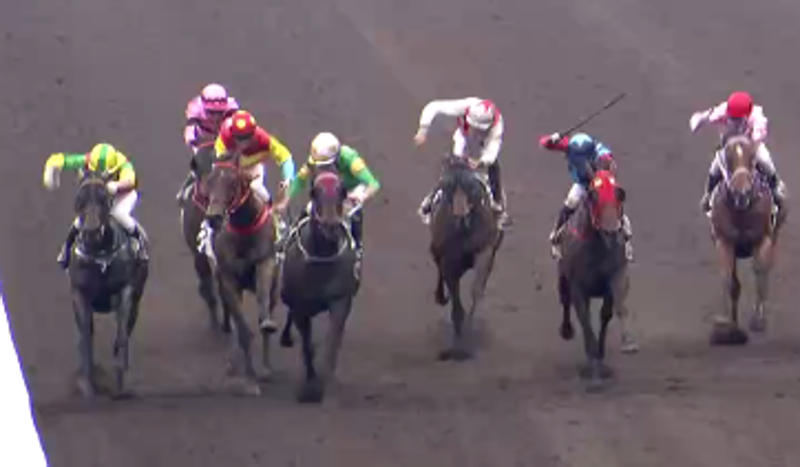 Italian Alberto Sanna is ticking all of the boxes and Saturday at Sha Tin he showed just how desperate he is in a race by dislocating his own shoulder when drawing the whip in the frantic final stages of race two. It was a measure of Sanna’s desperation that he wasn’t even in contention for the win on Enormous Honour and was fighting for fourth place in a Class Four on the dirt. And even then the dislocated limb didn’t stop Sanna from riding his horse out. “I’m very hungry, I have to get money, always,” he said after returning from hospital where doctors reset his arm, the 32-year-old adamant he would be riding trackwork on Sunday morning. Motivation for jockeys comes in many different forms, and rarely are they so open about it when the primary driver is money – yet Sanna is unashamedly mercenary. That is not to say Sanna lacks soul or lacks a competitive edge, if the one-handed push for a fourth-place cheque on Saturday wasn’t evidence enough, there was his effort to run back to the jockeys’ room for the next race after being back slammed onto the dirt two weekends ago. That’s when those parade ring regulars, notoriously unsentimental types who occasionally engage in slap fights over a lucky seat and take delight in booing Joao Moreira or Douglas Whyte over a bad ride, stood to applaud. Sanna is also filling the win column, his 11 victories since arriving in February sprinkled with long shots earning him an extension through to the end of the term. The next goal for Sanna is gaining a full-time place on the roster for 2018-19, something that will be decided by the Jockey Club Licensing Committee in early June. Sanna’s ability to ride 115 pounds and attitude surely has him well-placed at this stage. They must make them tough in Italy, with Sanna’s gritty display coming a week after his countryman Umberto Rispoli completed an amazing comeback from his own shoulder injury. Rispoli returned to riding just 10 days after breaking his collarbone and undergoing surgery, then won a race 23 days after his fall and again on Saturday. Maybe the hunger for Sanna comes from the tough road he has walked to get to Hong Kong. Coming from his homeland where the sport is in disarray, Sanna had stops in Qatar and Bahrain, but despite his success in the Middle East it was only a jockey shortage late last season that gave him his chance at Sha Tin. Sanna made the most of that late call up, riding two winners from the last three meetings, and judging from his recent exploits, it would seem Sanna won’t be letting go of his spot here any time soon.